The index opened positive and strayed strong for the entire session of trade making higher highs with each passing hour to close near the top at 7866.05, huge gain of 132.60 points. The broader market was strong with 1101 advances to 471 declines. Range for the series is at 7500-8100. Call option 8100 added 4.10 lacs OI with huge short covering seen at 7800 and below strike prices. Put option 8000-7400 added huge 40.16 lacs OI with profit booking seen at 7300 strike price. Nifty Open Interest is at 1,82,18,475 up by 6,09,825, with increase in price, most probably huge long build-up. 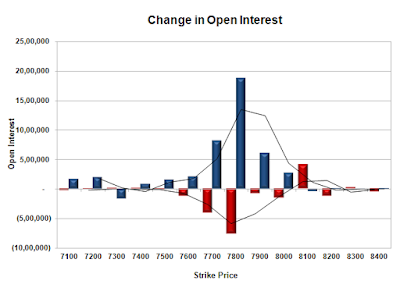 Bank Nifty Open Interest is at 16,77,930 down by 1,770, with increase in price, most probably short covering. FII’s bought 11794 contracts of Index Futures, which includes net 7820 contracts long build-up and 3974 contracts short covering, with increase in net OI by 3846 contracts, includes 39637 longs to 27843 shorts for the day. FII’s Index future open contract as on date is 148997 Longs to 91045 Shorts, Net 57952 up by 11794 contracts. 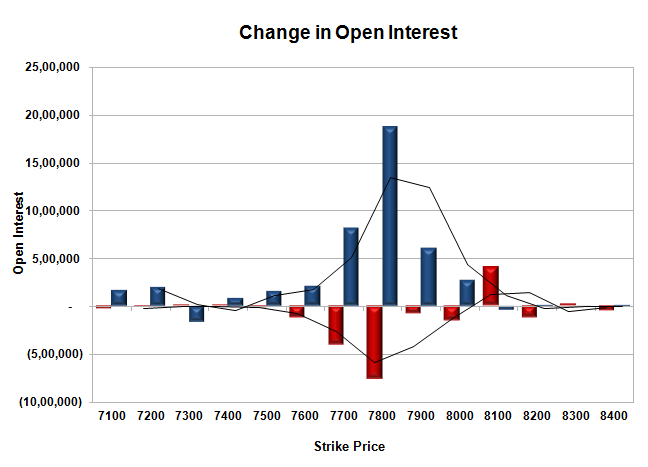 Initial support now at 7800, with OI of 44.47 lacs and below that at 7700 with OI of 52.61 lacs. 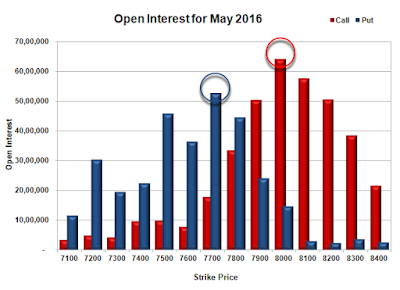 Initial resistance at 7900, with OI of 50.44 lacs and above that at 8000 with highest OI of 64.25 lacs. 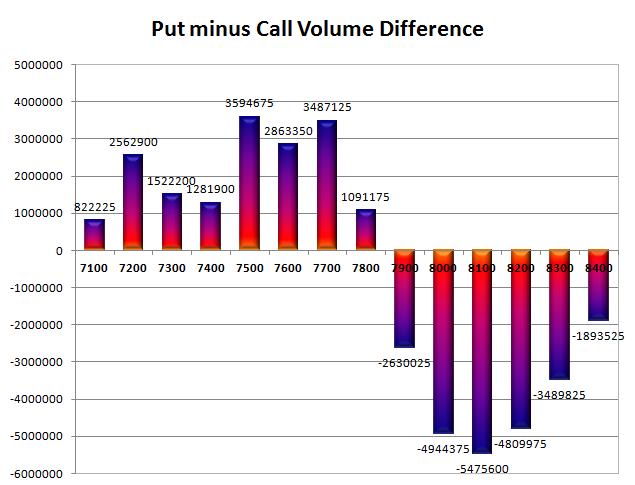 Day Range as per Option Table is 7770 - 7909 and as per VIX is 7798 - 7934 with 7831 as the Pivot.